In today’s world, fame is always within reach. It no longer requires years of toiling and plugging away at your desk, all thanks to the amplifying abilities of the social media. In one minute, you can go from a nobody to having top media publications scurrying to write a detailed piece about you because once again, the day has produced another personality to keep up with. For Cindy Kimberly, all it took was the phrase “OMG who is this”. Four words from the right person transformed her life from a $3 an hour babysitter to a catwalk model. To those who may not be familiar with the Instagram model, read below to learn about the social media produced fashion sensation. Cindy Kimberly was just another regular girl posting her selfies on the photo-sharing social network, Instagram before fame came for her. Born in Amsterdam, Netherlands on November 16, 1998, Cindy lived the majority of her life in Spain and as a result of her exposure to the multilingual culture of European life, she is fluent in English, Spanish, and Italian. She is however Dutch. Cindy might be mostly known for her modeling career, but she is also a passionate artist. She often draws portraits of herself and posts them on her Instagram page. She intends to study arts for her higher education. However, at the moment she’s focused on her modeling career. The Insta sensation has always been a fan of the camera, taking and posting beautiful pictures of herself on Instagram. Although she was not a professional model at the time, her curated Instagram page made her look like one. So perhaps the events of December 7, 2015, was the universe’s response to her digital lifestyle. Music superstar, Justin Bieber posted a picture of Cindy and added the caption “OMG who is this”. In an instant, the picture and the phrase catapulted Cindy from just another beautiful Instagram girl to a model. Once her account was identified by followers of Justin Bieber as @wolfiecindy, she gained millions of followers. Since then, she has shot up to the summit of digital modeling. In a sea of Instagram models and stars, she currently ranks at number 11 among Instagram models. Her career has also taken off outside of Instagram since the Bieber post. Immediately after the post, she received a ton of offers from several brands. She made her modeling debut for an online retailer, Very. Since then she’s worked with notable brands like Vanidad and participated in the Milan Fashion Week. She has also appeared on the cover of GQ Magazine in Spain. Cindy has drawn comparisons to Irina Shayk, Russian Supermodel and former girlfriend of soccer superstar, Cristiano Ronaldo, and also Angelina Jolie because of her full lips. Cindy Kimberly’s style is described as elegant and stylish. She combines modern techniques to achieve a cosmopolitan look that makes her very unique. It hasn’t all been smooth sailing since Cindy found stardom; she has had to deal with the downsides of fame. From jealous fans to integrity police, she has attracted extra scrutiny from the digital community in what resulted in her deleting her Tumblr account. Regardless, the model is thriving and is enjoying her life as a famous model as shown in her pictures to her over 4 million followers. She is being represented by the Modelling agency, Uno Model Agency. As a young beautiful model, Cindy Kimberly is not short of male and female admirers. Her fame has also made her relationship status a point of interest to her fans. She has been in a couple of relationships since she walked onto the stage of fame. 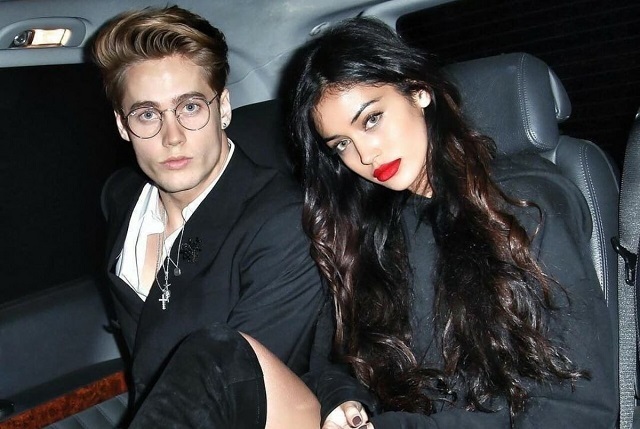 She was rumored to be dating a fellow model, Neels Visser; the two were seen kissing in Spain but she was later rumored to be involved with Xavier Serrano. Most recently, she was seen with Brooklyn Beckham. However, despite the rumors, the model is currently believed to be single. Although she has shielded her family from the crazy world of Fame and Hollywood spotlight, Cindy loves her family. We currently do not know if she has any siblings but we know she was born to a Spanish Father and an Indonesian Mother. They live in Costa Blanca in Spain. However, Cindy Kimberly is a Dutch national by birth and has Spanish and Indonesian origins. Body shape and size are important assets for a model and Cindy has great ones. The Dutch Model stands at 5 feet and 5 inches with a weight of 56kg. Her body frame is complimented with brown long hair and brown eyes.